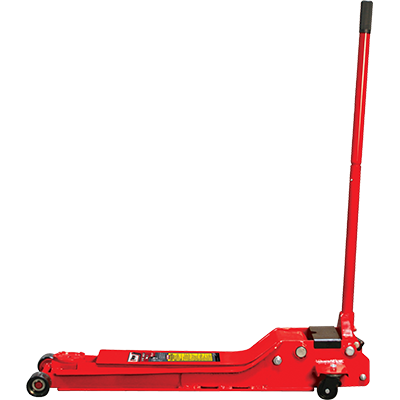 This 1.5-ton super-long floor jack is perfect for reaching the jacking points on most low ground-clearance vehicles. The Ranger RFJ-3000LPF low rider super-long garage floor jack features a lowered profile of only 2.75". At this level, virtually every vehicle that’s fit for the road can be serviced with this jack, and the extended 34" long chassis easily reaches the factory-approved jacking points on most low ground-clearance vehicles. Think about the vehicles you own and/or service, and if you own a shop, consider the vast variety you encounter over the course of a single day. It can be difficult to get under certain race cars or sports cars, even when using floor jacks that advertise themselves as being “low-profile.” The RFJ-3000LPF doesn’t even rise 3” above the ground in its collapsed state, making it one of the most versatile floor jacks ever made. With a 1.5 ton lifting capacity and accurate direct-drive pump operation, this super-long garage floor jack is the ideal combination of power and precision. Plus, the Ranger RFJ-3000LPF is constructed out of durable heavy steel and employs double-sealed hydraulics to extend the service life, so you know it's built to last. When it comes to floor jacks, manufacturing matters. Don’t settle for an off-brand or “discount” manufacturer when you need to trust your precious vehicles with these pieces of equipment. At Ranger, we’re proud to offer solidly made, top-of-the line floor jacks because we know they’ll measure up to your highest expectations and beyond. Local hardware stores make their profits by selling the cheapest equipment at the lowest price in the highest volume. They’re hoping that if something goes wrong with your floor jack (hopefully nothing major), you’ll find it worthwhile to buy a second cheap unit rather than invest in a higher-quality model. Ranger has always offered better equipment at an affordable price point, so don’t take your chances with your life or your vehicles. Trust Ranger and the RFJ-3000LPF to get the job done safely and efficiently. Your information will always be 100% secure and only used for contact purposes.